The Great Sand Dunes National Park is only a half hour away from the campground where we were staying. Back when we were in a big RV and towed a little car, we would have made a morning or afternoon visit using the car. That is the only drawback about traveling in this little RV, we don't tow a car. If we want to drive somewhere we have to break camp and drive the RV. Admittedly, there's not much to it, no jacks or slides to bring in. We just turn the front seats around back into driving configuration, wash dishes and put them away, unplug from electric, and go. That may only take 5 minutes, BUT, it's the thought that counts. The thought that we're pulling up stakes and moving on. It just feels silly, once we're on the road it feels like we should keep going, not return to the RV park. It's a very different mind-set from having a towed car to take on excursions. We find that we stay at locations for shorter times, and just move on when we want to see something else. I think 5 days is the longest we've stayed anywhere in the Roadtrek - other than when we're working at RV rallies. 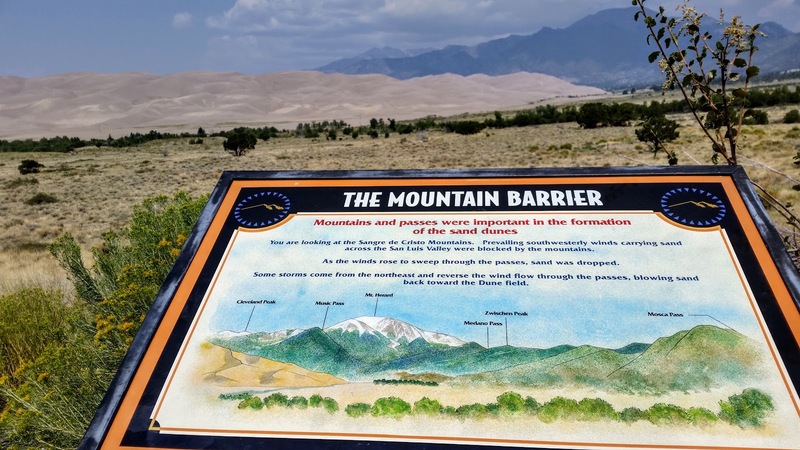 Anyway, when we left, we made the Great Sand Dunes Nat'l Park our first stop. Weird to have what looks like Death Valley, or the Sahara, up in the Colorado mountains. But that's what it is. It's actually the mountains, acting as a barrier, that makes the sand build up into these giant dunes. 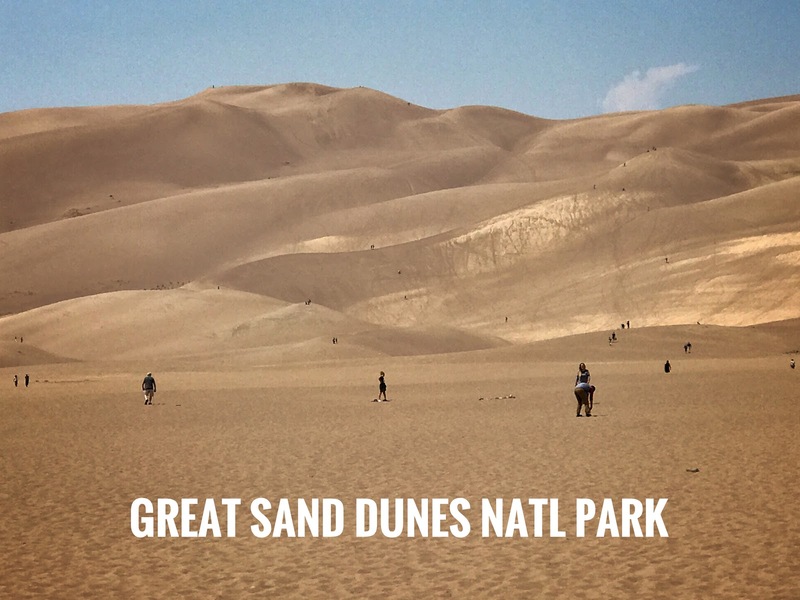 Kids, of all ages, were having fun on sand sleds sliding down these mountains of sand. We didn't do it. Sliding down would be fun, but first you had to climb up! And, it was hot. We were there in the afternoon and the sand was over 100 degrees. Just another half hour down the road is the town of Alamosa, Colorado. We made a reservation for a train ride there. 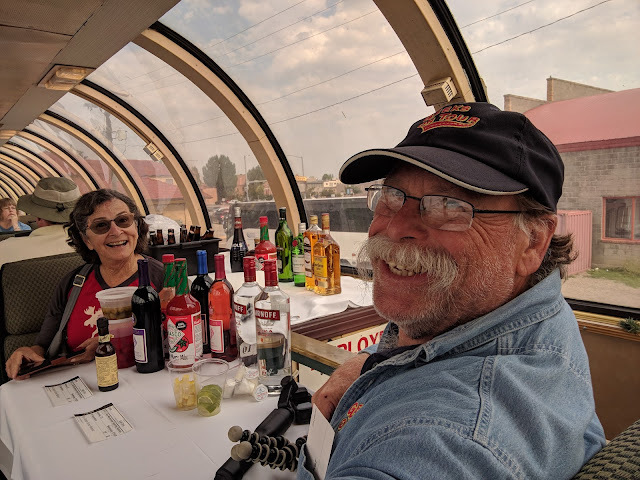 When we decided not to go to Durango - that also meant we wouldn't be doing the train ride that has long been on our list from Durango to Silverton. When we consulted Roadtrippers for things to do in this area - the Rio Grande Scenic Railway became a Must Do. It was an all day trip, complete with a meal and bar. Our tickets showed seat assignments of 19A and 19B. When we found our seats, we saw that they were being used as the bar. Hey! They got our number, right? I guess we missed the announcement that said it was open seating. We were free to move around throughout the train. One was completely open air - great for photos. One of the train cars was called Mardi Gras. Notice the words, Illinois Central, at the top? This is the train car where the song, City of New Orleans, was written. How cool! We went to that car to have lunch. Very nice. There was a major forest fire along the route just a few weeks ago. Wow. When we got back to Alamosa, we looked for a place to park by the Post Office. We had our absentee ballots, and other mail, forwarded to General Delivery here. The post office was on a quiet street and the library was right on the corner with a nice parking lot. We slept there, picked up our mail in the morning, and left. Where to? This was one of those delightful dilemmas! We really didn't know where we wanted to go. In 2 weeks, we had to be in Shawnee, Oklahoma, but there were a few different paths we could take. Straight south on back roads into New Mexico, where there were some hot springs, or on better roads in Colorado over to I-25 and to Capulin Volcano where we've been before. We almost left it up to the Van to decide :-) ... when we got to the intersection, which way would it turn? The deciding factor ended up being the information that those hot springs were only 97 degrees. That's not a hot springs! Let's stick to better roads, and hopefully better Internet then. Colorado it is - for at least another day or two. We lived in Durango for about seven years before going full-time rving. You HAVE to take that train. Open car is best (starboard side) but soot could be a problem. Going roundtrip makes for a long day. Take the bus for the return trip.